From the button Michael Mizrachi raised and Chris Klodnicki defended his big blind. On the first draw both players took two cards. Klodnicki checked, Mizrachi bet and Klodnicki raised. This wasn't enough for Mizrachi who put in another raise and Klodnicki called. On the second draw both players took one card, and Klodnicki check-called a bet. Klodnicki needed another card on the final draw while Mizrachi stood pat. Klodnicki didn't catch what he was looking for as he check-folded his cards. 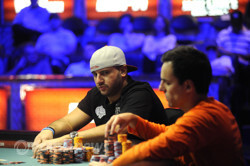 Michael "The Grinder' Mizrachi raised on the button and Chris Klodnicki called from the big blind. Klodnicki drew two and Mizrachi stood pat. Klodnicki then check-called a bet from Mizrachi. For the second draw, Klodnicki took one and Mizrachi stood pat. Klodnicki checked, Mizrachi bet and Klodnicki raised. Mizrachi called. On the final draw, both players stood pat. Klodnicki bet and Mizrachi called. 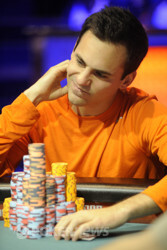 Klodnicki showed a nine-seven, but lost to Mizrachi's . From the button Chris Klodnicki raised, Michael Mizrachi three-bet from the big blind and Klodnicki called. Mizrachi took one card, Klodnicki needed two. Mizrachi bet, Klodnicki raised, Mizrachi re-raised and Klodnicki called. On the second draw both players stood pat. Mizrachi bet and Klodnicki called. On the final draw both players stood pat again, and Klodnicki called another bet from Mizrachi. Mizrachi showed and took down this pot. Chris Klodnicki raised on the button and Michael Mizrachi called from the big blind. Mizrachi then drew two and Klodnicki took one. After the draw, Mizrachi checked and Klodnicki bet. Mizrachi called. For the second draw, Mizrachi drew two and Klodnicki took one. Mizrachi checked and Klodnicki bet. 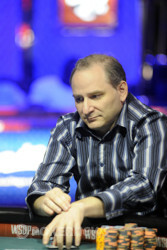 Mizrachi check-raised and Klodnicki folded. 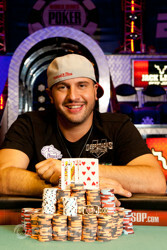 Michael Mizrachi had the bring-in, Chris Klodnicki completed and Mizrachi called. On fourth street Mizrachi had the best board, but he check-called. Fifth street changed around the action since Klodnicki was now the one check-calling. On sixth street Mizrachi bet again and Klodnicki folded. Chris Klodnicki raised on the button and Michael "The Grinder" Mizrachi reraised from the big blind. Klodnicki called and the flop came down . Mizrachi bet and Klodnicki called. The turn was the and both players checked. The river then completed the board with the and Mizrachi bet. Klodnicki folded and Mizrachi won the pot. 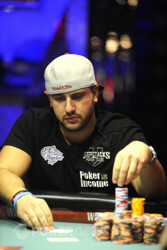 Klodnicki dropped back under six million in chips. From the button, Chris Klodnicki raised. Michael Mizrachi called from the big blind and the flop came down . Mizrachi checked and Klodnicki bet. Mizrachi raised and Klodnicki called. The was checked by both players on the turn before the completed the board on the river. Mizrachi checked and Klodnicki bet. Mizrachi folded and Klodnicki won the pot. Andy Bloch raised from the button and Michael "The Grinder" Mizrachi reraised from the small blind. Chris Klodnicki reraised from the big blind and Bloch called all in for 260,000 total. Mizrachi also called and the flop came down . On the flop, both Mizrachi and Klodnicki checked as the on-looking and all-in Bloch sat and waited. The turn was the and Mizrachi checked. Klodnicki bet and Mizrachi folded. Klodnicki turned up the and Bloch the . The river completed the board with the and ended the tournament for Bloch. He finished in third place and earned $561,738 for his finish. With Andy Bloch very short we just saw another pot between Michael Mizrachi and Chris Klodnicki. Klodnicki raised from the button and Mizrachi defended his big blind. The flop came down and Mizrachi checked. Klodnicki bet, Mizrachi raised and Klodnicki called. The turn was the and Mizrachi bet, Klodnicki called. On the river the hit and Mizrachi fired out another bet. Klodnicki opted to fold giving Mizrachi another big pot. From the button Michael Mizrachi raised and Chris Klodnicki three-bet from the small blind. Andy Bloch was in the big blind and he made the call, as did Mizrachi. 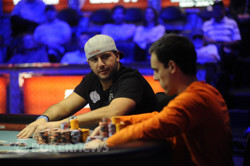 The flop came down and Klodnicki bet, Bloch raised and Mizrachi three-bet. Klodnicki folded his cards and Bloch made the call. The turn was the and Bloch check-called a bet from Mizrachi. The river was the and and Bloch check-called another bet. Mizrachi turned over and raked in this crucial pot. Bloch is now crippled and looking to be all in shortly.